On the occasion of the November Darshan we bring you the account of an experience of Sahana Devi which throws light on the role played by Krishna in the life and sadhana of Sri Aurobindo. Sahana Devi was among the earliest members of the Ashram. She came in 1928 and lived here until she passed away in 1990. 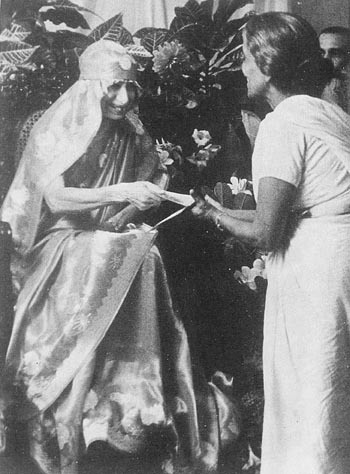 She was the niece of Deshbandhu Chittaranjan Das and it was in his house that, in her girlhood, she had seen Sri Aurobindo for the very first time, after the Alipore Bomb Case trial was over and he had been released. Before coming to the Ashram, Sahana Devi not only knew Rabindranath Tagore very well but was an authority on Rabindra Sangeet. In fact, she was such a renowned singer that many called her “the Nightingale of Bengal”. It was her friendship with Dilip Kumar Roy which brought her to the Ashram. Her inner call for a life of sadhana was so strong that she gave up an established career and fame to follow this path. You can view the Darshan message card on the Sri Aurobindo Ashram website by clicking here. Once there you may also download the message card in a print-friendly PDF format. Sri Aurobindo wrote extensively on political, social and cultural theory. His contributions to these fields are not always given the attention they deserve by contemporary thinkers. There are two main reasons for this. First, his political, social and cultural writings are scattered through six or seven volumes of his complete works. Secondly, the political and cultural worlds have changed greatly since he wrote. The editor of this anthology overcomes the first problem by selecting representative passages from the entire body of Sri Aurobindo's works. He deals with the second by providing historical background, and by relating Sri Aurobindo's ideas to those of modern thinkers.